The brand Koegler is dedicated to the development of innovative total solution around the convergence of Information Technology (IT), Consumer Electronics (CE) and Telecommunication (TK) in form of a range of products named « All-in-One » LCD-PC-TV. 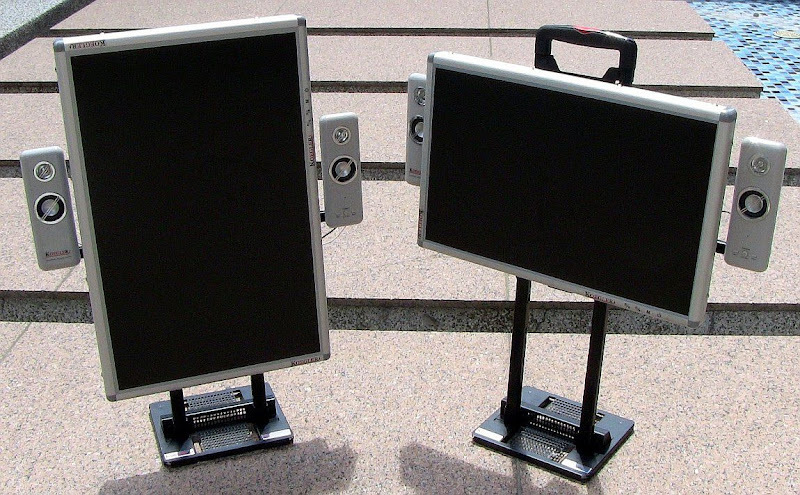 More basic products like monitors and television sets or other combo-products are deduced and previously marketed including innovative accessories. Koegler-Electronics Co. Ltd. is like a French-German Company founded in 2008 in Taiwan, in form of a limited company with a registered capital of 200 000 USD. The headquarter with office and prototype workshop is located in Jonghe, in the south-east of Taipei, where many high tech companies are established including some suppliers. The warehouse and pre-assembling factory for modules is in Taoyuan near the main international taiwanese airport including cargo allowing a fast import of some components and export of finished moduels to Europe and finished products to other regions. The final assembly is done depending on the final market in Taoyuan Taiwan or in Saarbruecken Germany for European market. Depending on the sales development, means volumes sold, assembling plants can be set-up in each key-market. Excellent price/offer ratio, not running always after each new tech hip, but adopt fast the best of the modern affordable technology when we think for ourselves it makes sense. Examples are: playing Blu-ray disks and high native resolution for screen and the television, because it offers the same amazing progress as from black and white to the color television, or combine several useful functions in one appliance, saving space and more easy to use. User friendliness, easy to use, even a higher number of functions or replaced devices, with best ergonomics. The products have to fit to the user, or the usage, of course not the opposite. Why only monitors with 16:9 aspect ratio in only landscape modus for mainly office work or internet surfing? Is it possible to find a more stupid behavior? Environment friendly based on well chosen materials, focus aluminum and steel and long life design, easy to repair or better to upgrade if a better technology becomes ready, stable, affordable and useful, and of course with lowest power consumption. Packaging: why should it not be possible without, especially as our products are almost transportable, would it not be possible that the logistic chain staff take a little more care or accept the use of returnable transportation box? Honesty, never promote features that nobody needs or nobody can see or hear, only to impress as a marketing trick. Establishing a really existing and affordable spare parts management also after the warranty period. And last but not least, a Koegler product, is designed, planned and manufactured by Koegler. This can only be confirmed by a very few brands and companies in that field! What would you feel after investing in a German high end car, if you would be informed later that it was neither produced by them and may be also designed by others (especially if and probably less qualified...)? Behind the brand and company Koegler you find Bruno Koegler, founder, owner, general manager and main designer, owner of the brand and the patents and not as usual a lot of shareholders and their complicate boards of managers seldom involved in the customer needs or product wished functions and usage. As an experimented user of PC and TV etc. I was often frustrated even with the high amount of brands and products found on the market, they were almost so similar, and what I wished or needed, nobody had. Bruno Koegler holds a Master of Science in Electromechanical Engineering from the Strasbourg Institute of Technology (previously ENSAIS, now INSA) in East France near Germany. After a few years in product engineering, Bruno accepted managing responsibilities in technology oriented business development. In this position, he developed innovative solutions for automotive electronics modules. Thanks to these solutions, the market share of his company in their primary customer group, a top 5 car maker, grew from 5 to 50 % in about 7 years. In the same industrial automotive group, he spent 3 years to build up a new product division in a French-Japanese joint-venture, with worldwide suppliers and customers. His next career step was as VP of Sales, Marketing and Engineering with a first-tier German automotive supplier (1,500 employees). Following that, he was given general management responsibilities (including sourcing, operations and sales) for an European subsidiary of a first-tier North American car components supplier. Some years ago, during yet another move, I had the idea to create the ideal appliance that would combine most of my home appliances like television set, stereo set, computer, CD/DVD player, video recorder and telephone, and also store and organize the several hundred CDs, DVDs, audio and video cassettes of my collection. Especially the bulky computer monitor and the big television set irked me, two unwieldy objects with essentially the same function. They were the first things I wanted to get rid of. Thanks to the advances in digitization achieved in all media fields, my dream of a true multimedia unit came within reach: an All-in-One appliance, "LCD-PC-TV-VCR-Phone", in which all the formerly separate media including latest technologies like Full HD TV broadcasting DVB-T2 and DVB-S2 and Blu Ray disks amazing movies, converge.That is how we understand the word "Multimedia"! I am very excited to be the first, and no doubt the most exacting, "customer" not only for this appliance, but also for a later range of equipments and dedicated services, which will enable you to combine in a simple way work, entertainment and communication, with everybody, everywhere and at every time. La marque Koegler se consacre au développement de solutions innovatives centrées autour de la convergenge numérique entre les technologies de l'information, de la communication (TIC) et de l'électronique grand public (EGP) sous la forme principalement d'une gamme de produits combinés "Tout-en-Un / All-in-One" LCD-PC-TV. Des produits plus génériques tels que moniteurs et téléviseurs ou autres produits combinés en sont déduits et mis sur le marché y compris des accessoires innovants. Koegler-Electronics Co. Ltd. est pour ainsi dire une société à responsabilitée limitée franco-allemande mais fondée à Taiwan au capital de 200 000 USD. Le siège de l'entreprise avec service études et atelier prototypes se trouve à Jonghe, commune en proche banlieue sud-ouest de Taipei ou beaucoup de sociétés high-tech dont certains fournisseurs sont déjà établies. Le magasin composants et l'usine de pré-assemblage (modules) sont situés à Taoyuan, proche de l'aéroport principal de Taiwan dont de fret pour l'importation de certains composants et l'exportation rapide de modules vers l'Europe ou produits finis vers l'Amérique. L'assemblage final est fait soit à Sarrebrueck Allemagne proche 57 Forbach en Lorraine pour marché Europe ou à Taoyuan Taiwan pour les autres marchés. En fonction de l'évolution de notre progression commerciale, c'est à dire nombre d'unités vendues, des sites d'assemblages sont possible au coeur de tout marché clef afin d'assurer notre rapidité et flexibilité marché qui est un de nos points forts particulièrement suivis. Voila environ 2 annees que je sévis ;-) principalement a Taiwan ma nouvelle patrie. Je dois confirmer que je suis heureux et bien surpris des progrès réalisés avec nos partenaires d'affaires principalement des fournisseurs développeurs, mème si je souhaiterais plus de sérieux et moins de supervision nécéssaire, du point de vue tenue des promesses de paramètres techniques ou de délais. Bruno Koegler est ingénieur diplomé en électromécanique de l'École Nationale Supérieure d'Ingénieurs de Strasbourg (anciennement ENSAIS depuis peu INSA) 67 Bas-Rhin, Est de la France limitrophe avec l'Allemagne. Bruno a démarré sa carrière en tant qu'Ingénieur Développement Produits pendant quelques années, complété par des responsabilités managériales en développement d'affaires. Grâce au développement dynamique de solutions innovantes et fortement concurrentielles il a pu augmenter les parts de marchés pour des modules électroniques de 5 a plus de 50% auprès d'un client constructeur automobile figurant parmi le top 5 mondial et ce en à peine 7 ans. Auprès du même groupe de sociétés, il consacra 3 années pour démarrer une nouvelle activité produit au travers d'une division start-up, joint-venture franco-japonais, avec clients et fournisseurs mondiaux. Plus tard il fut nommé Directeur Commerce, Marketing et Engineering auprès d'un équipementier automobile allemand de 1er rang ayant un effectif de 1.500 employés. Finalement il lui fut attribué la Direction Générale d'un site européen d'un équipementier automobile nord américain, incluant les responsabilités d'achats et approvisionnements, l'ensemble de la production et maintenance, en sus des activités études et commerce déjà habituelles. Il y a quelques années déjà -en particulier à l'approche de chaque déménagement- une idée me traversait l'esprit qui consistait à inventer l'appareil idéal qui doit réunir en un seul la plupart des appareils domestiques traditionnels tels que téléviseur, chaine stéréo, micro-ordinateur, lecteur CD/DVD, enregistreur audio/video et téléphone ainsi qu'aussi mes quelques centaines de CD, DVD, casettes audio et video. En particulier le moniteur du micro-ordinateur et le téléviseur, qui avaient pour moi la même fonction de base et le même défaut d'être encombrants et massifs, m'ont motivés fortement d'approfondir la poursuite de cette étude. Grâce aussi au progrès des techniques de numérisation, l'opportunité de réaliser cette convergence de l'ensemble des médias et fonctions de ces divers appareils en une solution idéale "Tout en Un" ou "All-in-One LCD-PC-TV-VCR-Phone" devenait de plus en plus réaliste. Ce n'est que comme celà que nous interprétons le mot "multimédia"! Je suis extrèmement réjoui d'être le premier mais aussi le plus exigeant "client" pour cet appareil innovant et bientôt une famille de produits et services dédiés, qui me permettent tout de suite et sous peu vous en tant que partenaires, de travailler, de se divertir et de communiquer partout, avec le monde entier et en permanence. Die Marke Koegler widmet sich der Entwicklung innovativen Gesamtlösungen bezüglich der Konvergenz (Verschmelzung) von Informationstechnologie (IT), Unterhaltungselektronik (UE) und Telekommunikation (TK) in Form einer Reihe von Produkten benannt « All-in-One » LCD-PC-TV. Einfachere Produkte wie Monitoren und Fernseher oder andere Kombi-Produkte werden davon abgeleitet und vorher vermarktet inklusive innovatives Zubehör. Koegler-Electronics Co. Ltd. ist sozusagen ein in Taiwan in 2008 gegruendetes Deutsch-Französisches Unternehmen, vergleichbar mit der GmbH mit 200 000 USD einbezahltes Kapital. Der Hauptsitz und Buero mit Prototypen Werkstatt befindet sich in Jonghe -ein Vorort von Taipei- wo viele High tech Firmen etabliert sind inklusive einige Lieferanten. Warenlager und Vor-Montage Werk befinden sich in Taoyuan in der Nähe vom Haupt- Flughafen fuer rasche Einfuhr und Export der Ware. Die Endmontage wird je nach Markt entweder in Taoyuan oder in Saarbrücken stattfinden. Je nach Verkaufsentwicklung, ist eine Endmontage um eine rasche und flexible Lieferung gewährleisten zu können, in jedem wichtigen Kernmarkt möglich. Hervorragendes Preis/Leistung Verhältnis, nicht unbedingt dem letzten Technikschrei nachlaufen, aber das Beste der bezahlbare moderne Technik an welche wir selbst glauben, weil sie sinnvoll ist. Beispiele sind Blu-ray und hohe native Aufloesung fuer den Bildschirm und das Fernsehen, weil es den gleichen Sprung anbietet wie vom Schwarz-weiss zum Farbfernseher, oder viele nuetzliche Funktionen in ein Gerät zu vereinen. Benutzerfreundlich, leicht zu bedienen, trotz der vielen Funktionen und ersetzte Gereate, beste Ergonomie. Die Produkte passen zum Benutzer, bz. zum Nutzen und nicht umgekehrt. Warum 16:9 Breitbild Monitoren im Landschaft Modus fuer meistens Buroarbeit oder Internet Surfen ? Gibt es einen größeren Schwachsinn in der Branche? Umweltfreundlich basierend auf gute Werkstoffe, Fokus Aluminium und Stahlblech und langlebig, einfach zu reparieren oder noch besser zu upgraden wenn eine bessere Technik zur Verfügung steht, und selbstverständlich der geringste Stromverbrauch. Verpackung : kann es nicht ohne sein, besonders da unsere Produkte eh tragbar sind, kann die Logistik Kette nicht etwas aufpassen oder umtauschbare Behälter akzeptieren ? Ehrlichkeit, keine Merkmale die entweder keiner braucht, bzw. keiner merkt. Ersatzteile bereit Und ein Koegler Produkt, wird von Koegler entwickelt, konstruiert und gefertigt. Das koennen in der Branche extrem wenig bestaetigen, aber was wuerden Sie denken, wenn die edlen Deutschen Autos nicht aus deren Werken kaemen oder von anderen (besonders wenn weniger edel...) designt waeren ? Hinter der Marke und Unternehmen Koegler steht der Gruender, Gesellschafter und Hauptentwickler Bruno Koegler, Inhaber der Marke und Patente und keine anonymen Aktionäre und deren komplizierte Gremien von Manager die selten Kunden- oder Produktnah sind. Als Benutzer von PC und TV usw. war ich öfters etwas leicht frustriert trotz vieler Marken und Produkten im Angebot, die aber so ähnlich waren, und was ich mir wünschte gab es leider nicht. Dipl. Ing. Bruno Koegler studierte an der Straßburger Technischen Hochschule (früher ENSAIS jetzt INSAS) in Ostfrankreich. Bruno begann seinen beruflichen Werdegang im Bereich Produkt Engineering. Danach bekam er Führungsverantwortung im Bereich der technisch orientierten Geschäftsentwicklung. Nach ca. 7 Jahren bedingt durch seine innovativen Lösungsentwicklungen für elektrische Fahrzeugmodule bei einem der 5-größten Autokonzerne weltweit, wurden die Marktanteile bei dieser Kundengruppe von 5 auf 50% erhöht. Innerhalb des gleichen Arbeitgeberkonzerns, beschäftigte er sich anschließend 3 Jahre mit dem Aufbau einer neuen Produktsparte in Form eines französisch-japanischer Joint-Venture, mit weltweit tätigen Lieferanten und Kunden. Später wurde er zum Vorstand Vertrieb, Marketing und Engineering bei einem First Tier Autozulieferer mit einer 1.500 personenstarken Belegschaft ernannt. Einige Jahre später übernahm er die Gesamtverantwortung inklusive Beschaffung, Produktion und Absatz des europäischen Werkes eines nordamerikanischen First Tier Autozulieferers. Ursprung der Idee - Das Leben ist kompliziert genug! In den letzten Jahren, insbesondere vor jedem Umzug, entstand der Gedanken ein innovatives Gerät zu erfinden, welches die meist genutzten Hausgeräte wie Fernseher, Stereoanlage, Computer, CD/DVD Spieler, Videorekorder und Telefon vereint, und auch die sperrige CD, DVD, Audio- und Videokassetten Sammlung überflüssig macht. Aber damit nicht genug, insbesondere das Tragen der sperrigen Geräte wie Monitor und Fernseher, die im Prinzip die selben Funktionen erfüllen, erhöhte meine Motivation diese Vision in die Realität umzusetzen. Die Digitalisierungstechnik ist heute soweit fortgeschritten, dass es für uns möglich ist die Konvergenz all dieser Medien und Funktionen zu einer "All-in-One" Lösung, sprich die Verschmelzung von "LCD-PC-TV-VideoRecorder-Telefon" zu realisieren. Das ist unsere Definition von "Multimedia"! Ich freue mich darauf, der erste aber hoffentlich auch der anspruchvollste Kunde für dieses Gerät und die darauf aufbauende Gerätefamilie zu sein, die es unseren Kunden und Partnern erlaubt an jedem Ort und zu jeder Zeit zu arbeiten, sich zu unterhalten und zu kommunizieren. Später kommen noch ergänzende und zugeschnittene Dienstleistungen und Services hinzu, die es unseren Kunden gestatten, sich in den verwirrenden Angeboten z. B. der Telekommunikation zurecht zu finden.